Yejin Kim joined BLAM lab as a research assistant in August 2014. 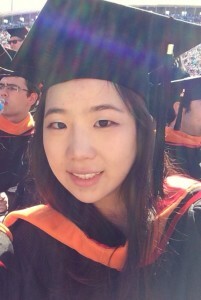 Yejin graduated from Johns Hopkins in 2013 with a bachelor’s degree in mechanical engineering and from Cornell University in 2014 with a master’s degree in biomedical engineering. She is interested in medical robotics. Specifically, she hopes to gain a better understanding of the motor control to develop an effective solutions for neurological hand rehabilitation.